Driving for a taxi company or rideshare services such as Uber or Lyft is a popular employment option for newcomers. According to a study reported in The Globe and Mail, Overqualified immigrants really are driving taxis in Canada, approximately half of all taxi drivers in Canada are immigrants. The 2012 study, Who Drives a Taxi in Canada?, also reported that immigrants accounted for more than 80% of the taxi drivers in the Greater Toronto Area (GTA). Frankly, sometimes it can be difficult for newcomers to find employment in fields that they are trained in. Working as a driver can provide income until more suitable employment is found. Finding work as a taxi or rideshare driver is relatively easy. The required training isn’t intensive or costly. GPS systems make it possible to perform the job efficiently, even for those recently arrived in the GTA. And for rideshare drivers, in particular, the job flexibility makes it a good choice for a second income. To drive a car as a job in Ontario, you must have a valid Class G (or higher) driver’s license. As we explain elsewhere on our website, In order to get a Class G license, a newcomer must first obtain a G1 and then a G2 license. Since a 12-month waiting period is mandated between levels, it may take up to two years to obtain a Class G license. All rideshare drivers and some taxi drivers are considered to be self-employed. As explained on the Government of Canada website, this means that the company you work for does not make payments on your behalf to the Canada Pension Plan (CPP), Employment Insurance (EI), or income tax. You will be expected to pay into the CPP when you file and pay your income tax, and you simply will not be eligible for EI. The job can be challenging, with long hours, high costs, low compensation, and no benefits. Having a car to drive is a basic requirement, whether one’s own, a leased vehicle or one that is shared. can apply to lease a cab from a brokerage (taxi company). Very few taxi drivers own their own cabs. Taxi drivers in the GTA often work 12-hour shifts, six or seven days a week. Pay is variable, depending on daily fares. Take-home pay is impacted by costs and fees that the driver incurs, such as the lease for the vehicle. According to the Government of Canada Job Bank website, taxi drivers earn a median wage of $13.50/hour. Currently, both Uber and Lyft provide rideshare services in the GTA. Uber was launched in that city in September 2014; Lyft in late 2017. Uber’s earlier launch means that there are more statistics and news articles about Uber. As a result, that company is more heavily referenced here. However, as reported in the Toronto Star, Patience pays off for Lyft’s Canadian expansion, the response of Lyft’s expansion into Ontario has been “overwhelming.” Given it’s healthy pricing competition with Uber, (see:Patience pays off for Lyft’s Canadian expansion), Lyft’s impressive expansion can be expected to continue. Whether partnering with Uber or Lyft, rideshare drivers need to meet many of the same requirements as taxi drivers. They also need to provide the vehicle (which they do not need to own; as long as Uber’s policies are followed, you can use a partner’s or friend’s car). Despite the requirements, rideshare driving is an attractive option because of its flexibility. Since you get to choose your hours of work, you can focus on “surge hours”: peak traffic times when fares are increased and earning potential is higher. The flexibility in scheduling also means that rideshare driving can be a full-time or part-time job. For many, it’s a second job; Uber estimates, according to the article, Uber Vs Lyft In Toronto (The Walrus, updated Dec/16) that about 60% of its drivers have other employment. Finally, choosing your own hours can help to build your confidence as a driver. If you’re not comfortable driving in bad weather or heavy traffic, you can sit those times out. And then you can strengthen your driving skills when you do feel comfortable on the road. According to a Global News report, We finally know what Uber drivers make, and it’s about minimum wage (May, 2018), Uber drivers earn, on average, $15.05/hour after expenses. That rate takes into consideration that drivers actually earn $27.43/hour. However, $12.38 out of every hour worked goes towards expenses such as vehicle registration, insurance, maintenance, depreciation, gas, and car washes, as well as cell phone costs and Uber fees. Also, keep in mind that the $15.05/hour estimate is gross taxable income. 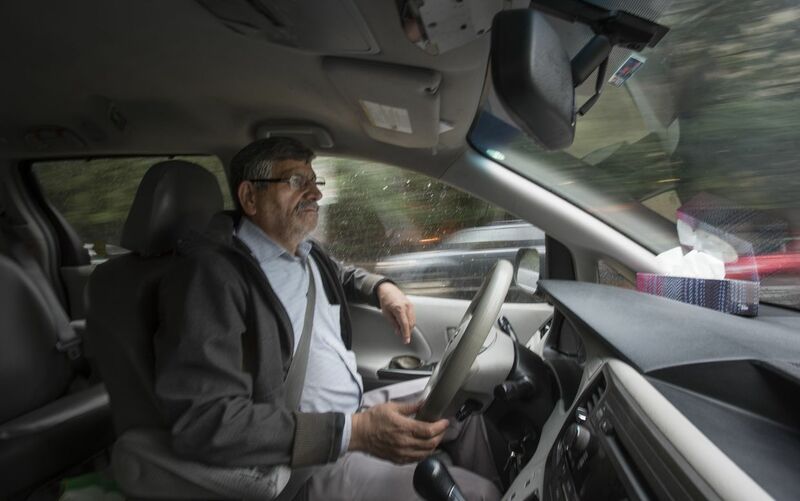 Because rideshare drivers are considered independent contractors, income tax and Canada Pension Plan (CPP) payments aren’t automatically deducted from their pay. One must be prepared to pay them when your annual income tax return is field. Income tax and CPP rates are variable, with many factors affecting your personal rate. Visit the Government of Canada website for more details. The Toronto Municipal Code, which governs the issuance of licenses for taxi and rideshare drivers, states that applicants “Must be able to communicate in English.” However, there is no requirement to demonstrate fluency. Instead, licensing staff simply gauge fluency “through the interactions the applicant has with city staff during the licensing process.” Each municipality within the GTA has its own code for such licensing. The Centre for Canadian Language Benchmarks website suggests a minimum of CLB 5 for taxi (and rideshare) drivers. Drivers work directly with the public and must be able to make small talk, take direction, offer advice, and handle complaints. They also need to be able to make professional phone calls, communicate with dispatchers, fill out forms, and write notes. The taxi/rideshare industry is not regulated in Canada. However, drivers require either a taxi driver’s license or a Private Transportation Company (PTC) license. Licenses are granted to successful applicants and must be renewed annually. The current fee to do so is $130. Rideshare drivers also need to obtain a specialized permit: a PTC (Private Transportation Company) license. However, this permit is granted based on vehicular eligibility. Provide a clean driving record and criminal record check. You do need to pass a quick and easy video-based course in order to drive for Uber. It takes about 15 minutes to complete. Lyft has online training guides to help get you started as a driver. And, as the Lyft website points out, you must have a smartphone. There are no training programs specifically for newcomers. However, the 25-hour training course at Centennial College is open to all. One recent participant in the program noted that a high percentage of recent immigrants are typically registered whenever the course is offered. With increasing traffic in the GTA and rising parking costs, the use of rideshare vehicles and taxis is bound to increase. However, with low barriers to entry, there will likely continue to be significant competition. A recent news report, Do Canada’s taxi drivers have a place in transportation’s changing future? (Globe & Mail, Oct 5/18), highlights the competitiveness of the Toronto market and especially the concerns of taxi drivers and those owning taxi plate licences in that market.